World-class ‘living lab’ rated among the top 1 percent of ‘green’ buildings in the U.S. The Golisano Institute for Sustainability has earned Leadership in Energy and Environmental Design (LEED) Platinum certification from the U.S. Green Building Council — the highest standard in the rating system. 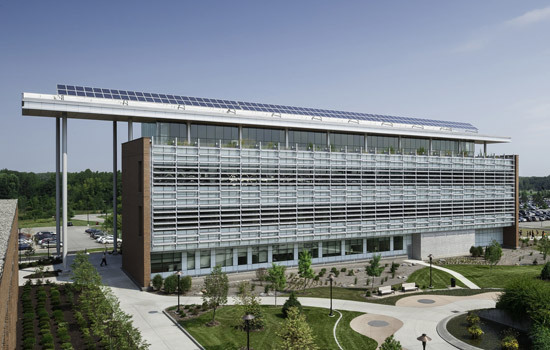 The Golisano Institute for Sustainability (GIS), a world-class “living lab” that represents Rochester Institute of Technology’s ongoing commitment to the environment, has been certified Leadership in Energy and Environmental Design (LEED®) Platinum by the U.S. Green Building Council (USGBC)—the highest standard that can be achieved in the rating system. With a score of 80 required to achieve Platinum level, the GIS building earned 89 out of a possible 110 points from the USGBC, which named the RIT facility “exceptional” and rated it among the top 1 percent of all green buildings in the United States today. The LEED Platinum certification was recognized during a 10 a.m. ceremony today at GIS featuring Rick Fedrizzi, president of the Washington, D.C.-based USGBC, New York state and federal government officials, and local business leaders. The GIS building was designed by FXFOWLE in collaboration with SWBR Architects. LeChase Construction Co. served as the design-build team leader, Stantec as civil engineering consultants and M/E Engineering for mechanical/electrical/plumbing systems design. As a result of the building’s energy-efficient systems and high-performance facades, 400kW fuel cell and the 40kW solar array, GIS is designed to be 56 percent more efficient than a standard building—exceeding the points in the LEED rating system’s “optimize energy” credit. Designed with the capacity to optimize daylight and energy savings, the facility has extensive data sensors and feedback loops where RIT will monitor and inform building operations. “Through its control systems and micro-grid technology, the GIS building has the capacity to be one of the most informative ‘green’ buildings in the world,” said John Moore, RIT’s assistant vice president for Facilities Management Services. The building has only consumed about a third of the electricity it has generated over the past year. The rest of the electricity is fed into the campus grid for use in other campus facilities. In addition, more than half of the building’s water needs have been met using recaptured rainwater stored in a 1,700-gallon tank in the building’s basement. Cutting-edge “green” technology has been incorporated into every inch of the 84,000-square-foot building—from the solar panels on the soaring canopy to its vertical wind turbines. According to Enid Cardinal, RIT’s senior sustainability advisor to the president, the facility’s construction was environmentally benevolent as well. Construction of the GIS building began in 2011. The LEED Platinum certification marks the latest construction honor for the RIT facility. Engineering News-Record (ENR) New York named the building the region’s best project in the “Green Project” category, which recognizes the country’s best construction projects. The New York State Association of General Contractors granted the project its Jeffery J. Zogg Build New York Award, which highlights the construction industry’s positive impact on building and heavy construction in New York. The GIS facility, RIT’s fourth LEED-certified building on campus, marks RIT’s second LEED Platinum project after the University Services Center earned the designation in 2010. RIT has two other LEED projects pending with Sebastian and Lenore Rosica Hall and Institute Hall. GIS was established in 2007 with a $10 million gift from Paychex Inc. founder and philanthropist B. Thomas Golisano. RIT was awarded a $13.1 million grant by the National Institute of Standards and Technology Construction Grant Program, and $15 million in funding from the state of New York that was used toward construction of the facility and equipment. Partners and affiliates include Xerox Corp., Staples Inc., Caterpillar Inc., Eastman Kodak, and Rochester Midland Corp., with support from the Henry Luce Foundation, the Helen and Ritter Shumway Foundation, and the Chester F. and Dorris Carlson Charitable Trust.